How Often Should a Horse's Feet be Trimmed for Health and Soundness? 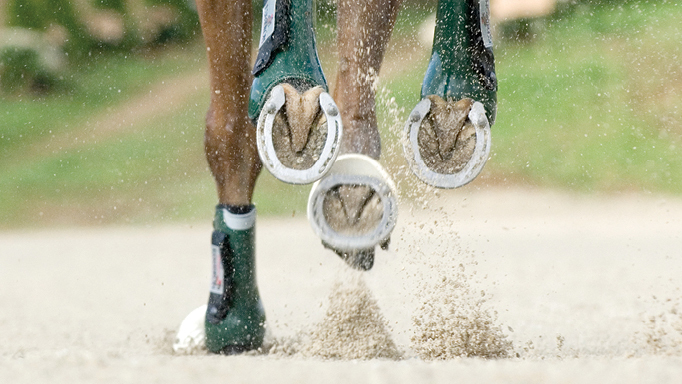 On average, most horses do well with a trimming/shoeing schedule of about six weeks, and that is the rule of thumb most hoof care professionals use as a starting point. However, there is a lot of variation in what horses need to maintain their feet optimally, and individual needs can change from time to time. Most barefoot trimmers recommend that horses get trimmed every five to six weeks, though some horses will need shorter cycles and some can safely go longer. Generally speaking, it is better to have the horse trimmed more frequently and take off only small amounts, rather than let a lot of growth build up, as the frequent-but-little strategy is more likely to keep the hoof close to ideal. This is particularly true for horses that are prone to developing any kind of imbalance. What you don’t want is for the horse to have so much growth between trimmings that the foot starts to crack, flare or develop serious imbalances. Many of the same principles apply to shod horses, the main difference being that shoes prevent any natural wear. Thus, we need to recognize that if the farrier trims the hoof to its ideal length when he puts the shoe on, the hoof is growing longer than ideal from that moment on. One of the problems with this scenario is that it is very easy for shod feet to become peripherally loaded, meaning that the walls become the only structure bearing the horse’s weight. This effectively “hangs” the foot from the laminae and lifts all the other structures meant to share in weight bearing – the back of the frog, the bars, and the outer part of the sole – off the ground. 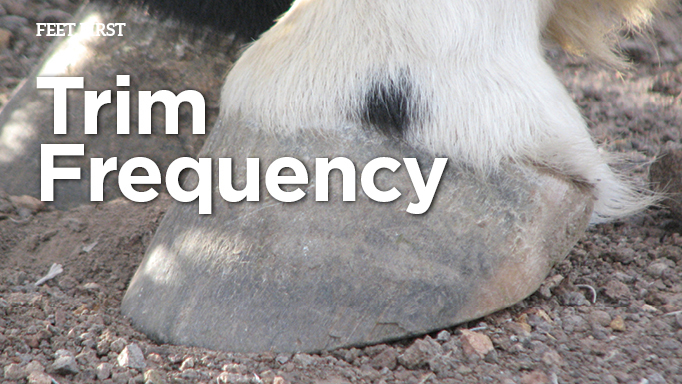 The equine foot was not designed to work this way, and the dysfunction caused by peripheral loading may be a contributing factor in many cases of hoof-related lameness. 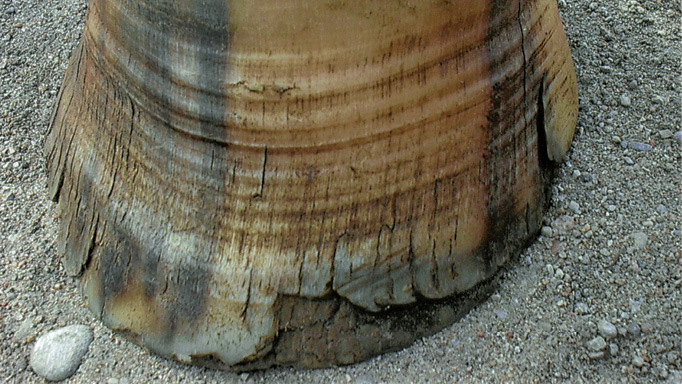 Bare feet can also be peripherally loaded if the walls are overgrown, but the excess wall on a bare foot tends to break off, which is another form of self-trimming. A shod foot is, therefore, far more likely to experience peripheral loading, a risk that increases the longer the shoe is left on. 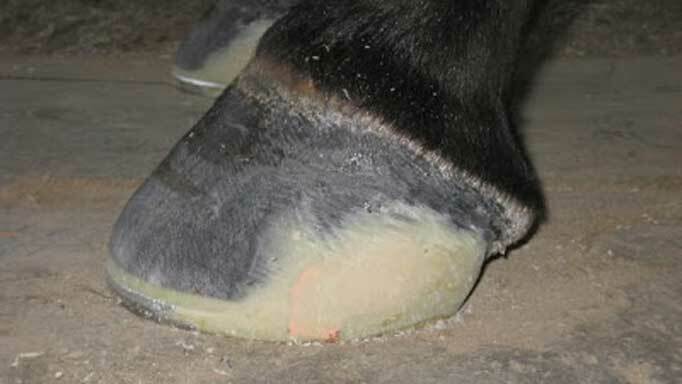 Leaving shoes on for too long is also thought to be a major cause of heel contraction, which sets the hoof up for all kinds of problems as well. These include thrush, impeded circulation, caudal foot issues and increased concussion. Owners of shod horses, therefore, need to be especially careful not to let their horses’ feet get overgrown, which again means that a shorter shoeing cycle is often better than a longer one, especially at times of year when horses’ feet are putting out more growth, which is most likely to happen in the spring and summer. Your hoof care professional is the best person to advise you on what the ideal cycle is for your horse, though it is important for every horse owner to learn to recognize when their horse’s feet are looking good and functioning well versus when they are not. 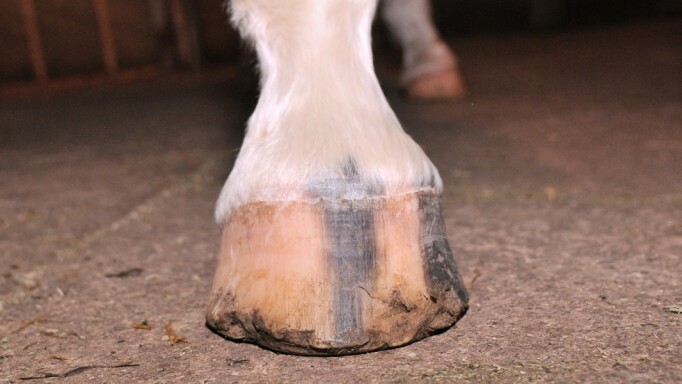 With just a bit of education, you will be able to see if your horse’s feet are getting too long, out of balance, or developing other issues that might be related to the frequency or quality of hoof care he is getting.